A life of wholeness and purpose are well within our reach–The Art of Abundance outlines ten rules, or practices, that lay the foundation for a life worth living. 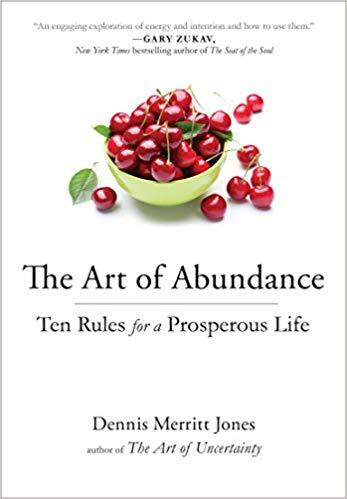 Whether we’re striving for a new job, a higher salary, or a stronger relationship, Dennis Merritt Jones explains in The Art of Abundance that we all essentially want the same things: freedom, inner peace, and a life filled with purpose and meaning. He argues that a life of wholeness and peaceful satisfaction is readily available to us–we just need the eyes to see it and the faith to claim it. The problem is that most people don’t know where to look for such a life. This book will help readers open their eyes to the limitless abundance that lies waiting just beyond their current belief system. In The Art of Abundance, Jones identifies ten rules or practices that, when followed faithfully, lay the foundation for a life worth living. In order to make each rule as easy to apply as possible, Jones lays out the premise, the problem, the principle, the practice, and the payoff of each. These practices assist readers in creating a greater flow of goodness into their lives–in ways they may have never considered. Our Fall Enrichment program is a 7-week, in-depth spiritual exploration of the book. The Universe is always calling you higher, beyond your own boundaries, to experience an expanded dimension of life with greater meaning, purpose, and abundance. It is a calling to express something special and unique to life, to be a catalyst for Good. The energy of abundance follows through the path of least resistance. Passion reduces the resistance of fear and a consciousness of lack. Bring passion to everything you wish to experience greater prosperity. Your consciousness creates your experience of life. Your mind is the most powerful ally you could possibly have in creating a life of abundance, purpose, and meaning. You live in the ever-expanding creative process of the Universe. The principle of abundance is omnipresent and therefore available to you every moment of the day. As your awareness of this deepens, you begin to see and experience the principle of abundance operating everywhere you look. Behind every thought, deed, and action of every human being of rational mind on this planet is the desire for freedom, inner peace, and a life worth living – a life that is filled with purpose and meaning, a life of fulfillment and wholeness.